When my kids finally convinced me to read the Harry Potter series recently I didn’t think I’d find too many references to Australia, let alone an Australianism. In the first respect I was correct. 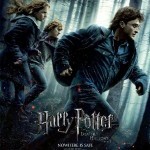 The only reference is in the final book when Hermione erases her parents’ memories and sends them to far off Australia – safe from the prying eyes of Voldemort and his Death Eaters. Not long after this account of magical transportation to Australia we find Harry, Ron, and Hermione doing it tough and camping out, and to my surprise using a billycan to cook wild mushrooms for dinner. I didn’t exactly fall off my broomstick but I was surprised seeing this word used by a British author in the final book of an international series of bestsellers. I checked my latest British English dictionary only to be further baffled that both billy and its variant billycan are labelled British. The etymology said that it was possibly from an Aboriginal word ‘billa’ meaning water—perhaps a billabong connection? I decided it was time to go to an Australian dictionary, in particular the Australian National Dictionary. And the reason I hadn’t fallen off my broomstick became clear—billy and billycan are widely-used Australian words that entered Australian English in the 1840s and are ultimately derived from Scottish dialect. Borrowings from British dialects have added some 175 words to Australian English—including dinkum, goog, barrack, chook, chunder, and larrikin. 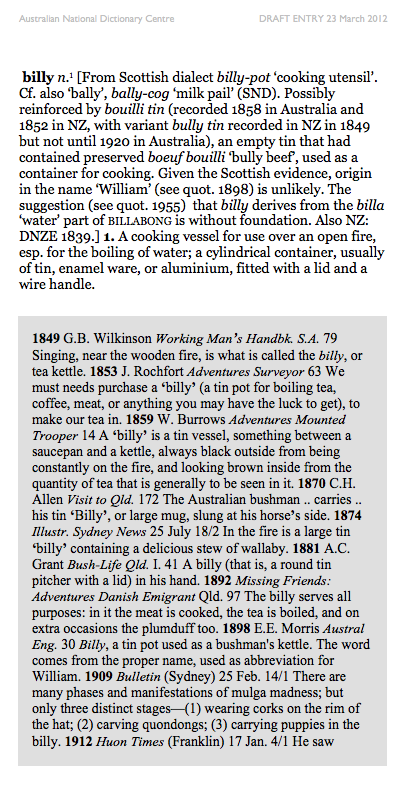 It would be interesting to know how widespread billycan has become in the British Isles and if there has been any influence from the word’s common use in Australia. 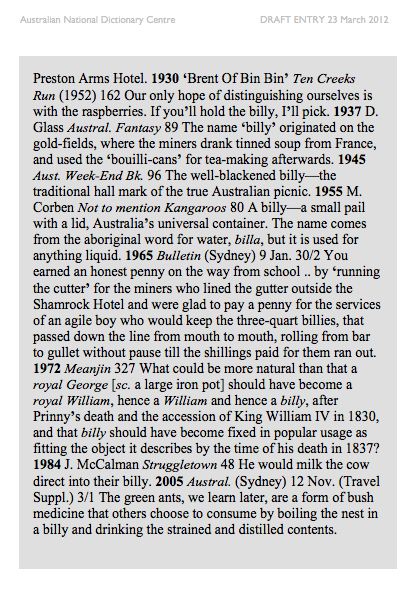 See our new draft entries for billy and billycan below to get a fuller picture of these iconic Australian words. This entry was posted in Australian National Dictionary, draft entry and tagged barrack, billy, billycan, borrowing, British dialect, chook, chunder, dinkum, etymology, goog, Harry Potter, larrikin, Scottish dialect by Mark Gwynn. Bookmark the permalink. 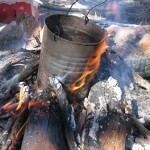 This ‘billy’ so much part of my life I’ve never once thought outside of ‘camping’ equipment. Is it connected at all to ‘billy-cart’? I never go camping without it! While we don’t have a definite etymology for billycart we know that it is not likely to be related to the the Scottish word billy-pot from which our billy derives. At this stage we believe that billycart comes from billy(goat) – this particular billy is the pet form of the name William. 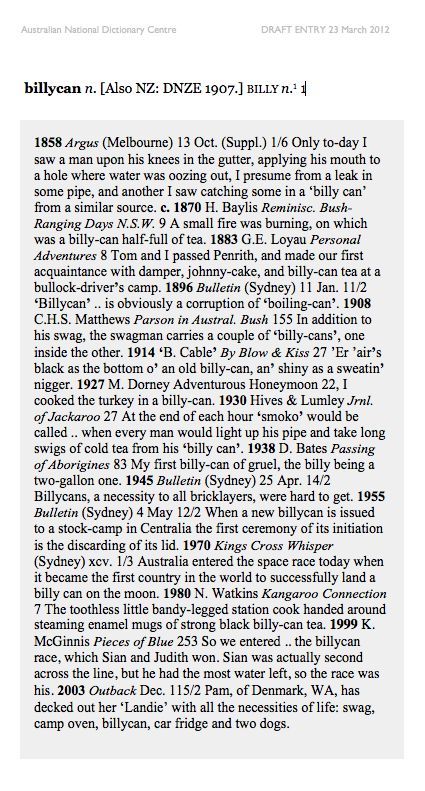 Billycart is an Australian word and our first evidence comes from 1906. A quotation from the Kalgoorlie Western Argus of 1905 has the word ‘billy-goat cart’ which gives us more evidence for billycart being derived from billygoat! Thanks for your question. The “only reference”? There are a couple of others actually- the one that comes to mind at the moment is the Wagga Wagga Werewolf mentioned in Chamber of Secrets. Thanks for that Xun. You’re right about the Wagga Wagga Werewolf – I don’t know how I missed it. We won’t be able to claim Wagga Wagga Werewolf as an Australianism but it’s certainly a reference to Australia as you point out. We do have Wagga Wagga blanket (or rug) and Wagga Wagga pot (or bell) – a cattle bell! Let me know if you find any other Australian references in Harry Potter. Thanks again for your interest.